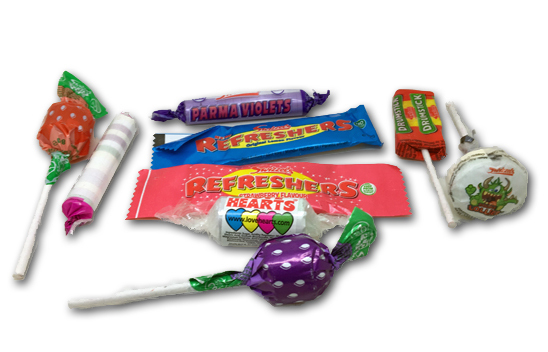 We learned a few months back that a “lolly bag” is simply a bag of sweets in some parts of the world that aren’t here. Taking that newfound knowledge, I’m using the transitive clause of math to assume that this “bumper bag” is sort of the same thing. Nondescript lollipops: I had the blackcurrant one, and it was tasty. Nothing “special”, no filling on the inside, just a tasty old fashioned lollipop. Fizzers: Well, ..they’re not fizzy. If you’re expecting some Zots-like fizz, you’re in for a disappointment. However, they’re pretty much just like American Smarties, but tangier. Yummy. Parma Violets: This was what I was most looking forward to trying. I have to say, a bit of a disappointment. Extremely subtle, it’s the same consistency as the Fizzers, but with a gentle hint of violet. Turns out…I don’t really like violet. It’s sorta like eating perfume to me. Refreshers: ahh, Refreshers. Outstanding. Sort of like an Airhead in shape and consistency, these have a zingy powder inside that give them a bonus pop. Also more natural tasting than Airheads, for whatever that’s worth. While we’re at it, as the bag shows, there’s no artificial coloring in anything in this bag-that’s cool, especially because there’s some intense colored stuff here. Things like beetroot, black carrots (wtf), and blackcurrants are used for coloring. Awesome. Drumsticks: oh man, this was a treat. I’d seen these for years but had never tried, and now that I have, I can say I’m a fan. In the completely new flavor combo department, these are raspberry & milk flavored-not something I’d think I’d gravitate to, as milk related candies generally aren’t my bag, These though, are really nice. Subtle, yet flavorful, it’s like a milkshake on a stick. Hey Swizzels, feel free to use that if you want. Love Hearts: These were another surprise, because I swear I’d had them before. 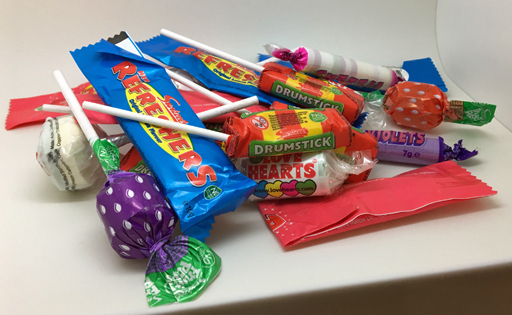 Turns out I’d had the generic American crap Halloween version, which were really nondescript. These are pretty similar to the Fizzers, but perhaps not as tangy. Still though, I wolfed down a roll in no time, as the flavors were good, and there definitely was some zing to it. Double Lollies: This is compressed dextrose on a stick, with two flavors: one on top, one on the bottom. They remind me of a similar Mexican lollipop, and were pretty damn good. Not sour, but with a nice juicy fruit flavor AND a bit of creaminess. 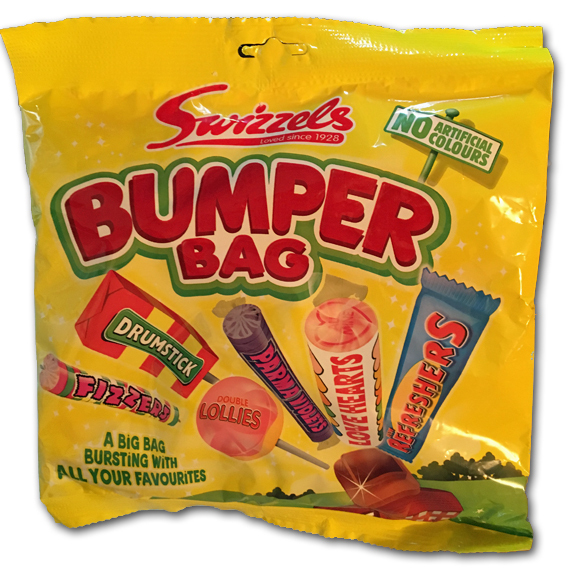 Bonus fun points because you cenobite into it at any time and start eating it like a sweet tart-although it’s more crumbly in texture than your typical Sweetart, which helps it break down a lot quicker. Yum. I really enjoyed almost everything in this (huge) bag, especially the concept of a mixed bag of candies. It’s fun! Click the link below for a shockingly cheap deal on something imported from the UK like this. 11 bucks for 3 huge bags? That’s a no-brainer, folks, especially if you’re immature and like candies targeted at youngsters like me. Wait. That sounds creepy. But you get it, right? AHA my plan worked perfectly. Yep, parma violets are gross as hell. Some people like them, but.. who really wants perfumed candy? Not I. The rest of the contents of the bumper bag roXX, with two capital X’s.